Fats, oils and grease (FOG) are an expensive problem for sewer systems. Cooking grease coats pipelines similar to the way that fatty foods clog human arteries. The grease clings to the inside of the pipe-lines, eventually causing complete blockage. 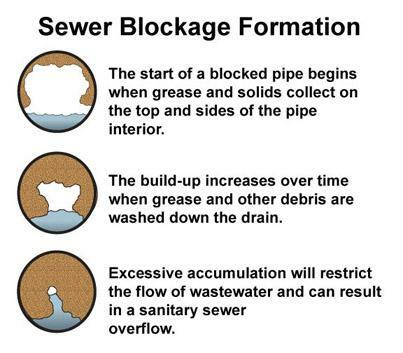 By doing your part at home, you can help to keep the District sewer system running efficiently. FOG includes animal fats, vegetable fats and oils used to cook and prepare food. FOG in liquid form may not seem harmful, but as it cools it congeals, hardens and sticks to the inner lining of drainage pipes. SCRAPE grease and food scraps from dishes, pots/pans and utensils and dispose in the trash or food waste bin. POUR fats, oils and grease into an empty glass jar or coffee can. Once the materials have cooled, solidified and the container is full secure it with a lid and dispose of it in the trash. The District spends an average of $50,000/year hydro-jetting the wastewater pipes as part of the scheduled preventative maintenance program. This helps avoid costly sewer backups. Below is a short, informative video about the causes of FOG and how you can help from the City of Bothell.